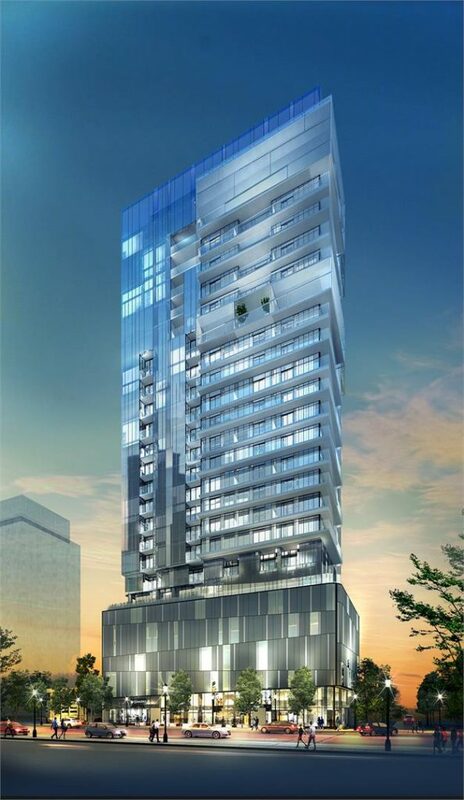 New high-rise development planned for 347 Martha Street in Burlington. Design by RAW. More to follow. This one will be the tallest building in Burlington. This was recommended for refusal by the Burlington Planning Department, and is now heading for a hearing at the OMB on March 14, 2016 because of the failure Burlington Council to render a decision within the 120 day time required by Ontario. The applications propose an inappropriate level of intensification on a very small parcel without consideration of the adverse impacts on adjacent properties. The significant reduction of numerous development regulations that are required to facilitate this intensification proposal and the failure to satisfy the City’s Official Plan policies results in an application that is not consistent with the PPS. I am not familiar with Burlington's Planning history nor its Council history re: development, so no editorial in here, just reporting. The project is on Martha Street, three blocks east of Brant (Burlington's main street) and right at Lakeshore, and within the Downtown Core zoning area. The application requests a 28‐storey mixed use building containing retail at grade along Lakeshore Road, 226 residential units above, 5 levels of underground parking and 3 levels of above‐ ground parking. Amenities on the 22nd storey. Apparently this has been appealed to the OMB and the city is opposed to the application. Big news for this part of the GTA. This is a pretty big board ruling. Specifically interesting is the boards insistence that Growth projections from the growth plans are minimums only - you can't just start denying development applications if you have reached your population growth projections as Burlington has (and continues to vastly exceed). 26 floors is also by far the tallest thing in Burlington. @Edward Skira, this project is smack-dab in downtown Burlington, shouldn't be listed as Hamilton. That other project (Paradigm Residences??) has also been listed as Hamilton incorrectly for some time now. Downtown Burlington is going to get quite busy in the near future with all these developments going up. 5 active tower applications are active in the immediate downtown, with several more in the surrounding area. As someone that lives in Oakville and is envious of Burlington's downtown development, I can't help but agree. I've given up on this town which is why I'm moving out once I'm finished with my education. That's because we don't have a page for Burlington so we put it in with the closest city. Hence Hamilton. And the saga continues here. According to the NRU, The City of Burlington has now appealed the OMB decision to the superior court, stating that there were several errors in law in the boards decision. The city really, really doesn't want this approved.